Posted October 2nd, 2015 by Martin Welford & filed under Opal-6, Uncategorized, Windows CE. We have customers using CAN for a wide variety of applications. Vehicle-based devices are the most common, and these range from earth moving machinery, to busses to boats. It is also used on non-moving industrial devices as an easy and reliable way for parts of a physically distributed system to communicate. The Opal-6 IoT Development Kit includes CAN PHYs and super-quick push-wire connectors to enable rapid prototyping of applications. The WEC 2013 source code is here. If you are using Linux, the SocketCAN API is a good way to access the CAN bus. If CAN is a requirement for your next project, or if you think it might be a useful feature to include, drop us a line so we can talk further about getting you up and running. Posted March 14th, 2014 by Martin Welford & filed under Uncategorized. 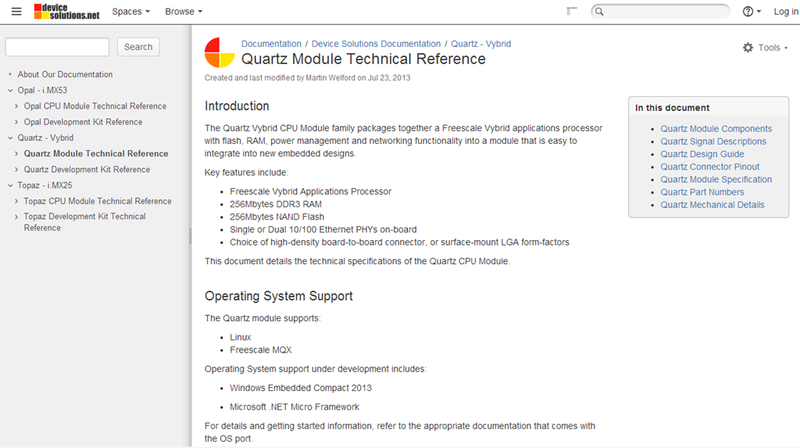 Technical documentation has come a long way from the days of printed data sheets. Working as a software engineer, I remember seeing data books get thicker year after year while the pages got thinner! Fortunately PDFs took over and are still the most common way to get documentation today. This is what we have been using for our modules and development kits. Until now. 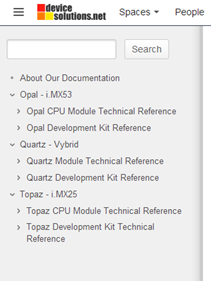 We have recently moved all our documentation online and are using Confluence to host our pages. The biggest reason to move to the online system was updates. 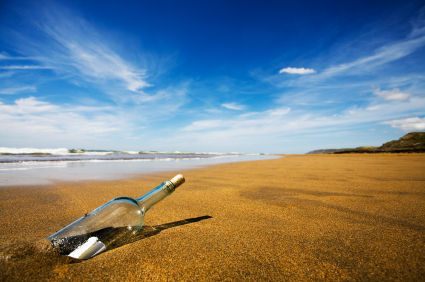 We can easily add new content or fix issues without having to publish a new pdf every time. It is also easier to search for the information you need, and we can include links to information such as schematics and sample code. 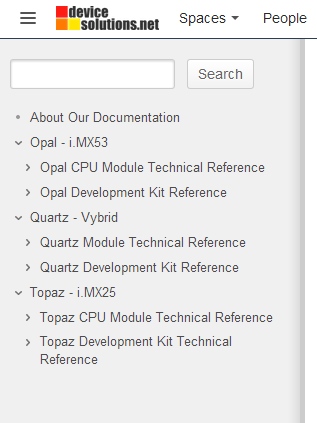 As you can see from the image to the left, information is organised by product and by module/development kit. There is also the search box at the top which is a great shortcut to find what you need in a hurry. 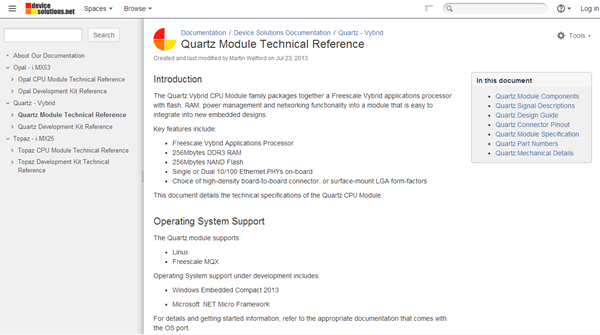 This next image shows the Quartz module main page. Most pages have a contents link on the right hand side for quickly skipping to the item you are interested in. Another key feature about using an online tool is feedback. At the bottom of each page you can leave a comment. This is for anything on your mind – technical questions, something missing in the docs or if you spot a typo. If you really need a pdf, there is an option under the Tools menu (top right hand side of each page) to export to PDF or Word. This exports the current page only and not the child pages. If you made it this far, you obviouly have some interest in how documentation is presented! Let us know what you think by taking the survey below or leaving a comment. Posted June 10th, 2010 by Martin Welford & filed under Uncategorized. This event in Florida (21-24 June) is a great way to get in-depth training on Freescale products and see what new things they have. It’s also a really nice change from the current weather in NZ! Let us know if you are going to be at the show, or are in the area – we would love to meet up with you. Posted September 1st, 2010 by Martin Welford & filed under Uncategorized. And no, I’m not an investor in this company – just a fan of the product! Posted September 6th, 2010 by Martin Welford & filed under Uncategorized. We are located very near to the Earthquake that struck Christchurch on Saturday morning local time. No-one was hurt, but things are a bit of a mess. Please excuse us if we take a little longer to get back to your enquiries. Posted January 3rd, 2011 by Martin Welford & filed under Uncategorized. Posted February 25th, 2011 by Martin Welford & filed under Uncategorized. This is a quick update to let you know what is happening with regard to this on-going event. We are all OK and so is our office. The staff and families of our extended network of contractors and suppliers we have been able to contact so far (which is most of them) are also fine. Power is still out to a lot of the city, so we have not been able to contact everyone yet. We have heard there is damage to our Contract Manufacturers buildings, and will be updated on that next week. There will be delays for production, but we can’t say much beyond that right now. Couriers are not operating so we are unable to ship orders this week. Our courier is operating so we can ship orders placed via the web site. We are still attending Embedded World in Germany next week. Posted June 3rd, 2011 by Martin Welford & filed under Uncategorized. We will be in San Antonio, TX on the 20-23 June for this event. Please let us know if you are going to be there – we would love to meet up! Posted June 6th, 2008 by Martin Welford & filed under Uncategorized. It’s official – the .NET Micro Framework Team Blog has the list of the new features in V3.0 of the .NET Micro Framework. There will be a public beta later in the “Summer” (or Winter for those of you who live in the same half of the world as I do!). We will be working to get as many of these feaures working on Tahoe as we can, and you can help! Let us know which features are important to you and why! Leave a comment below, or sign up to beta test new features when they are released. Posted July 29th, 2008 by Martin Welford & filed under Uncategorized. Microsoft has just released the first beta of the V3.0 SDK to the Microsoft Connect website. They are also giving away a very cool univeral remote control that runs the .NET Micro Framework that you could win if you sign up and download the beta! Check out Jan Kucera’s web site for a detailed list of new features and changes to existing features. We are busy working with the firmware beta, and expect to have a release for the Tahoe board available within 2 weeks. Subscribe to this blog to keep up-to-date with announcements!